I’d not been out much since my last trip to Sligo. I was finding it a challenge to even contemplate going out with a camera in hand. Work was very busy leaving me tired and family life was equally so. This blog will outline a very simple method to challenge & force you out with the camera. Sunsets & sunrises had looked great for a week and I kept promising myself tomorrow was the day I would go out. It just wasn’t happening. Camera club season is back in full swing and I have little to nothing for any competitions coming up. However, we had a wonderful landscape photography lecture from Marek Biegalski which motivated me to get back out. I set myself the challenge……. This was simple – 3 mornings in a row regardless of the weather. This saw me heading for an old favourite location – High Rock just north of Donabate. The weather was appalling. High east winds left me struggling with sea spray and dangerous waves. I simply couldn’t get close to the action but I spent an hour trying until I eventually admitted defeat and moved to a more sheltered spot just up the coast. It was good to be back out again. Excitement was the order of the day as I headed to a new location that had been on the list for a while – Bray head. I had left with tonnes of time to spare but heavy traffic put a stop to that. I arrived in Bray with no time to spare. The sun was already popping up leaving me two choices. Either start shooting from where I stood or go looking for the spot I had intended visiting. Option 1 pre-vailed and I quickly composed what I could. There wasn’t much to choose from, and after the 1st couple of shots the sun was well and truly up. I went in search of my chosen spot to at least scope it out for a future visit. On arrival I found it quite pleasant for the conditions at hand as the sun was to my right hand side. I again spent around an hour simply playing and I am happy that it is a location for the future. The highlight of the week came that morning. 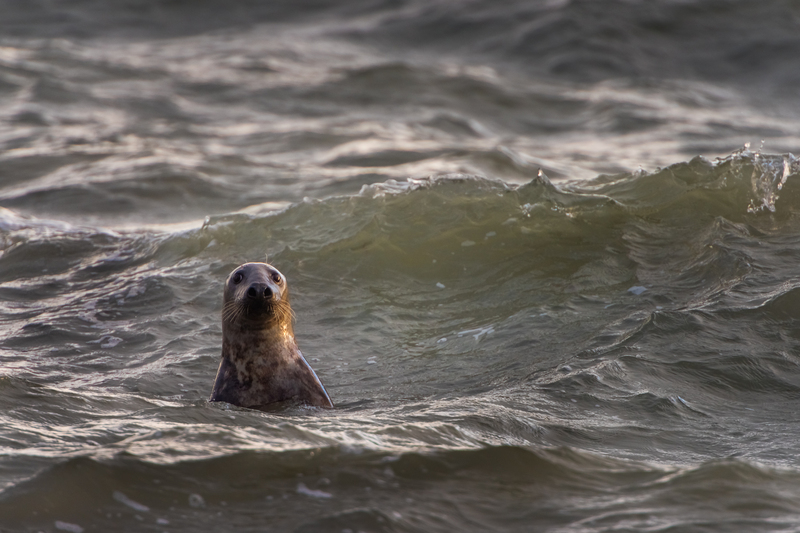 As I was shooting, a seal appeared in the water just in front of me. He sat watching my every move for around 10 minutes as I sat watching his. I eventually put on a longer lens to get a shot. I fired off a couple of frames and checked the back of the screen to make sure my settings were right. When I looked back up, he was gone and didn’t return. Nature photography is not my thing but I love the image I got as he strained his neck to look over a wave watching me. Not the best image in the world but a special moment captured for me. I finished work that day in south Wicklow and decided to try a long exposure shot I’d had in mind for quite a while. The day was overcast and the tide was high – perfect for the location I had been advised of by another photographer. Yet again, it was a spot I’d not been to before but I might as well explore and hopefully come home with a stunner instead of facing rush hour traffic in Dublin. It wasn’t to be – I could see the spot I wanted to get to but the high tide and east winds made it impossible to reach. Two hours were spent climbing rocks and crossing fields but I just could not find a way down to where I needed to be. Its a location that needs a re-think. This nearly didn’t happen – the forecast was uninspiring. This old body was quite tired after two early mornings and late nights in a row. The previous evenings lack of a result had also deflated me and left my legs were very sore from the climbing. Forcing myself out of bed, I knew it was the last morning of the challenge and set off for Rush beach. A location I have been to many, many times but never come home with the image I wanted. Tides are very hard to get right here and even then you need the wind from the east to give plenty of movement in the water. On arrival, I knew immediately I was in with a really good chance of getting my shot. Everything looked right for a change. The water was just perfect, the waves were not too strong and the light looked like it had potential. I picked a spot and waited. It paid off big time and I finally got that shot I wanted – one for the portfolio!! Had I not stuck to the challenge it would have eluded me until another day. To say I was happy was an understatement. 3 days in a row for one image I love. Still I would say it was worth it even if I was wrecked by the end of it. If I make 5 of these images in a year I’ve had a really successful one. My next big photographic challenge takes place in two weeks – 4 days shooting on the Isle Of Skye. Fingers crossed for some dramatic light and scenery.